Is your circuit board not coming out quite right? This page is for you. Here are solutions to common issues. My file renders but won’t cut all the traces. Make sure you've selected a small enough tool to fit between the traces and pads on your board. If none of the preset tools will fit, you can alter the design as needed in your PCB design software. We have a handy reference for which surface-mount packages are compatible with the Bantam Tools Desktop Milling Machine Software. Did your board import looking correct, but the motion plan indicated only parts of the board would be cut? If you designed your board with a ground plane, make sure to set the isolation value for the ground plane to something that is just slightly wider than the width of the tool. For example, if you want to cut your board with a 1/32" end mill, set the isolation value to .033". The trace clearances should render, and your board will be cut. Consult your particular flavor of PCB design software for information on where you isolation value can be changed. My through-holes and vias didn’t cut. Try adding a smaller tool to your imported plan file. The holes in your board might be too small to accommodate the tool you’ve selected. For example, if you’ve chosen a 1/32" end mill but the holes and some traces aren’t rendered with toolpaths on the machining bed as shown in the software preview, you might try adding a 1/64" end mill. If the holes render, the machine will cut them. If not, you might need to select a smaller tool or go back into your PCB software and adjust the drill sizes. If you’re using EAGLE, you can save your .brd file, and the refresh button in the imported plan file window in the software will allow you to update the file without re-importing it. Spacing and hole size are too small for chosen end mill. Spacing and hole size are correct for chosen end mill. All of my traces came out really deep or really shallow. If all or nearly all of your traces are much deeper than you expected (the default is 0.006"), your FR-1 board may be thicker than what’s set in in the software. Click Setup Material and increase the thickness of your material. Then use a pair of digital calipers to measure the thickness of your FR-1 board. If all or nearly all of your traces are shallower than you expected, the opposite may be true, so you’d want to decrease the thickness of your material in the software. Occasionally, this issue is caused when a tool is removed and then reinserted without going through the tool-locating process. To rule this out, simply go through the process again, but select the tool that’s already inserted instead of inserting a new one. Some of my traces came out really deep. If most of your traces cut to the depth you expected (the default is 0.006") but some of them are really deep, your board is probably not lying completely flat. Make sure the spoilboard is clean and free of tape and glue before attaching a new PCB blank. Make sure the tape you use to attach your PCB blank to the machining bed is free of bubbles and does not overlap anywhere. Make sure you use enough tape: 80% to 100% of the back of the board should be covered in tape. Make sure the the board isn’t bowed, which can cause the tape to unstick in certain places. You can correct a bowed board by gently bending it in the opposite direction. When I try to import my Gerber files, they’re all greyed out in the Import Files window. The software isn’t recognizing them. If you’re using KiCad, check your Gerber and NC Drill file settings to make sure they match the settings specified in the KiCad guide. Note that only the top copper layer is selectable when importing Gerber files; the other files are included automatically by association. See our Gerber documentation for more information. Also note that each PCB software application generates Gerber and drill files slightly differently. If you’re having trouble importing into the software and we don’t have a guide for your software, feel free to email us a support@bantamtools.com. When I use oval holes/slotted holes/the G85 command, the software won’t recognize my NC Drill file. The software doesn’t currently support the G85 command, also known as oval holes or slotted holes. 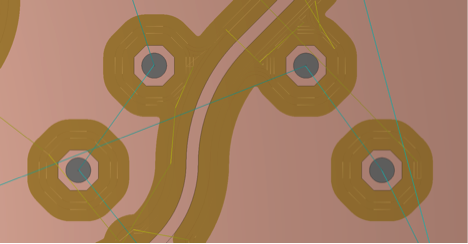 The workaround in the meantime is to make a line of overlapping holes. A good rule of thumb is have the distance between the hole centers be half the hole diameter. So a line of holes that are 0.032" in diameter would be spaced every 0.016", which should allow a 1/32" flat end mill to cut them as a single slot.